The Yale Alley Cats are a world-renowned all-men a cappella singing group from Yale University, making music around the world since our founding back in 1943. Come see the grand debut of the Alley Cats Class of 2022! Tickets are available here. #throwbackthursday to our concert at Eddie's Attic in Atlanta! Here's Hale '20 singing some Michael Jackson! Our "Whiffencats" on @whiffenpoofs Tap Night! 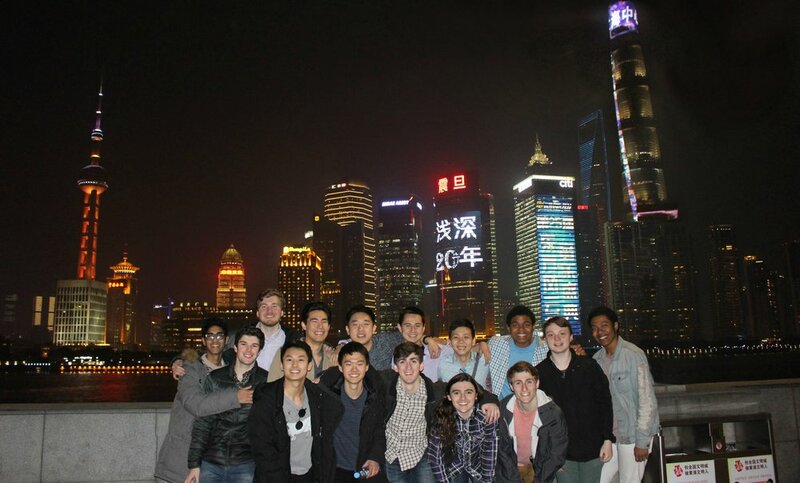 Congratulations to Dustin Zhao '19+1 and Mohit Sani '19+1 on being admitted to the nation's oldest a cappella group, we're sending you all our Alley Cat love as you embark on this journey around the world! Kaori West ('21) pulling out some sweet riffs for the Chinese radio's 88.1integrated broadcasting. We're having a great time in Luoyang! The guys had a wonderful time in Guiyang! Catch us on the local news in China... who's ready for Xi'an? China tour has been amazing so far! The Cats had a blast performing for the Jiya School in Zhongshan! The Cats are having a great time on China tour! The steep hike up the Great Wall was well worth the view. Join the Alley Cats for our 74th Annual Champagne Jamboree, this Saturday at 7:30 in SSS 114! Tickets are only $5 for students. The Cats had a great time singing for Sprint the other week! Now, who's excited for Cham Jam? Tyler Miles ('20) singing a brand new Alicia Keys arrangement at Eddie's Attic over Winter Tour. Who's excited for Cham Jam? Tyler Shen '21 singing "Latch" at the Drew Charter School in Atlanta. Winter tour has been a blast, next stop: China! As our winter tour in Atlanta draws to a close, here’s a #selfie with the @wachoir. We spent Friday singing with students of Woodward Academy, who rocked us with their musicality and energy! As we return to the New Haven cold, we’d like to thank everyone who made this such a special winter tour! The Cats had a blast performing at Eddie's Attic! Check out this clip featuring Pitchpipe Mohit Sani '19! The Cats are having a great time in Atlanta! Atlanta tour is off to a great start! The Cats successfully escaped with 15 minutes to spare! The Cats loved spreading Holiday Cheer for the Shops at Yale today! We're almost ready for Winter Tour... next stop, Atlanta! Come watch our talented kittens in their campus debut with New Blue! Today in Sheffield-Sterling-Strathcona Hall at 9:30pm! Tickets are available at the door! Introducing our new Class of 2021 Kittens: Raphie, Liam, Tyler, Jason, Zach, and Kaori! Welcome to the family!